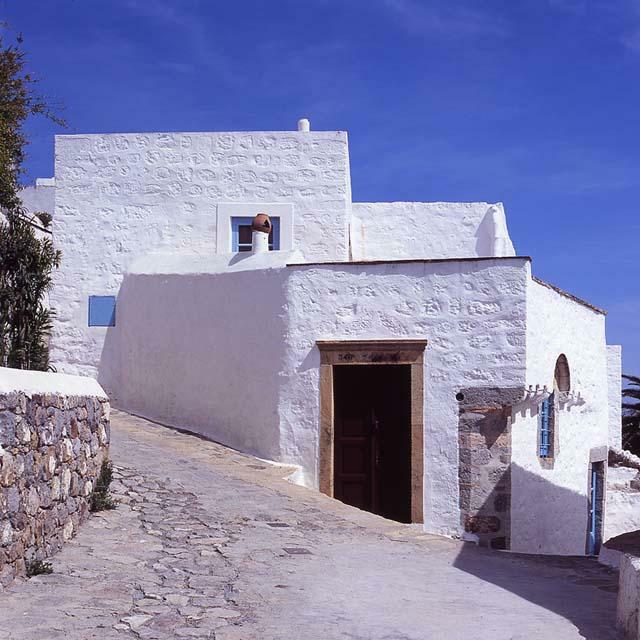 This house was initially a dark ruin on the south side of the urban medieval agglomeration of Hora with a view to the bay of Grikos and the stunning water-locked rock of Kalikatsou with hermit caves reminder of St. Johns Apocalypse cave. 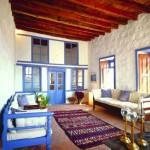 There were promising details to the development of the house. The robust exterior chiseled stone frames to doors and windows, the characteristic medieval carved stones protruding under cantilevered top terrace, the white-washed broken down volumes clinging to the inclination with a back view to St John’s Monastery Fort, the high apex of Hora. Around it, since the 11th century, grew the spiral of pirate defensive walks. 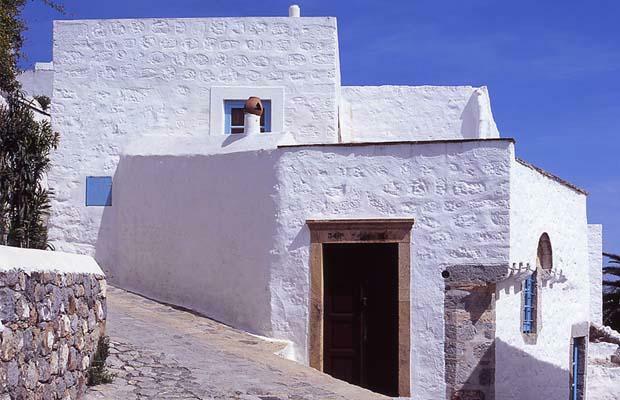 The fate of these winter houses was to service summer vacations while keeping their exterior forms according to the specifications of the Byzantine Archaeological Offices in Rhodes. Hora is their success story named in 2008 the World’s Most Beautiful Agglomeration. In this house levels distributed the generations. The top is the parent’s quarters and the lower is the three boys. Omitting the construction of a south room enlarged the terrace to the Mediterranean sun. Carving out an inner atrium brought light to inner spaces. In the atrium the north side retained a rock that holds the upper pedestrian walk, on the second side light was given to dining room below and master bedroom above, the third helped illuminate the seating room above and the children’s room below and the fourth lit and ventilated a two level stack of bathrooms. The double paneled main door leads to the terrace and master spaces above, guiding to dining/kitchen and seating/boys rooms below. Thick Patmian terracotta tiles cover the floors. 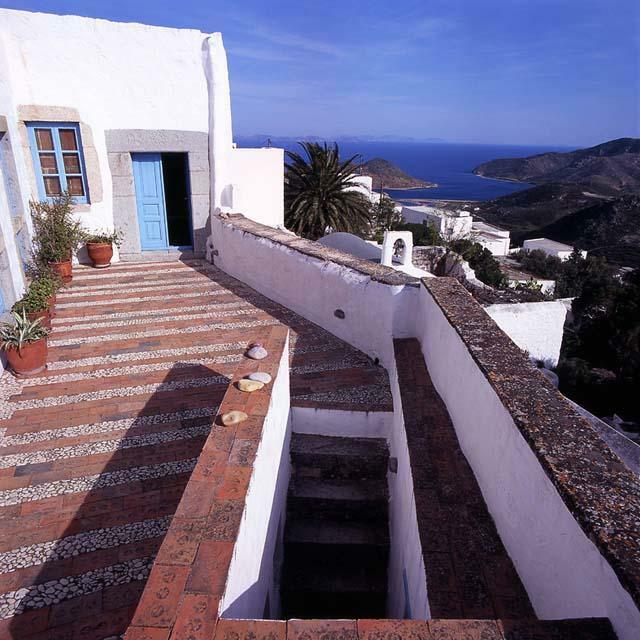 White pebbles between them underline the terrace’s airiness just as at the small uncovered entry courtyard below. 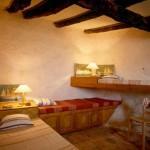 The new southwest bedroom has two lower windows that graze the terrace to light the lower dining. 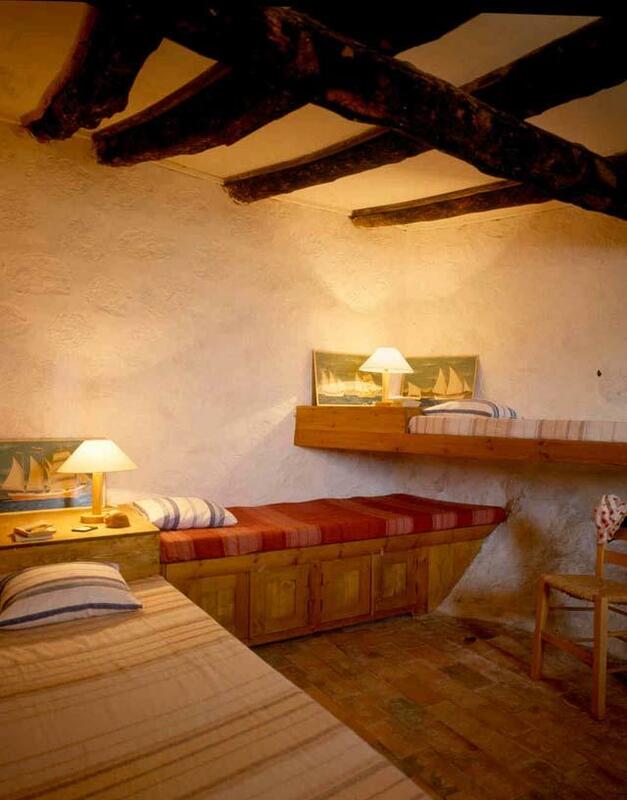 Interior details adapt to the island’s traditional features. 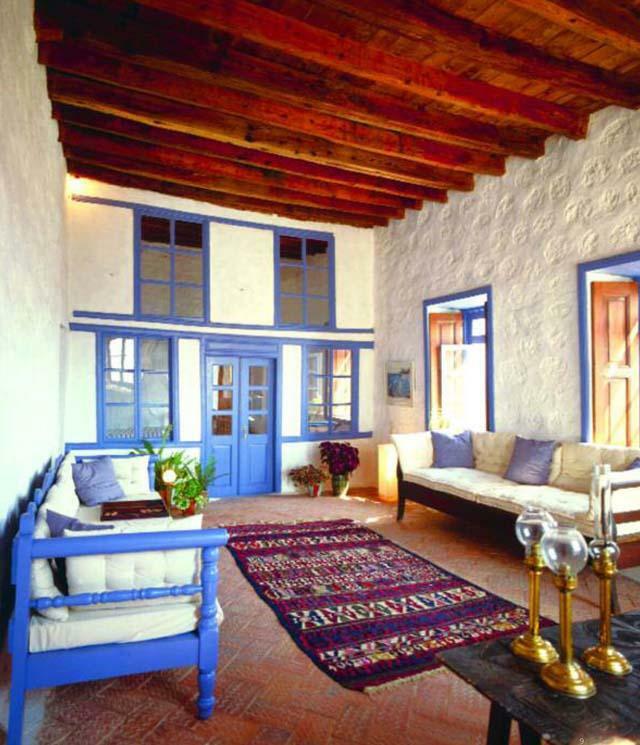 Kilim rugs add colour to the blue and white inner spaces with wood-trussed ceilings, inner varnished window shutters and clay floors. 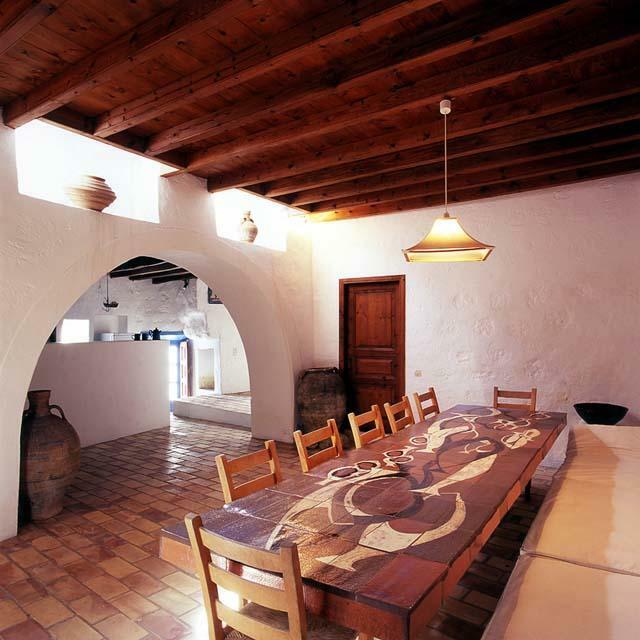 The built dining room table’s tiles were baked in a Patmos kiln but designed by the architect. The five openings between the tall guest room and seating room is a game played with local windows. The children’s roof with the tortuous trunks (from non-existing everlasting trees) were painted black on the painted white boards, complementing the looks of sufficiency. Roofs stand on thick wood beams (the most expensive island material) that are tied with branches, covered with seaweed and layers of top clay (constantly renewed) to guide scarce rain water to the cistern at foundation level. Stone walls have mud and seaweed joints. This, with wood bracing create the 10cm acoustic and thermal dividers. Seaweed is the clay tiles proper infrastructure implement.